One of my duties at Antiwar.com is to find news links for our readers. As you can imagine, it can get pretty tedious reading the same basic story across the different news agencies, but occasionally I am rewarded with a real gem for my troubles. Yesterday, tucked away deep inside an article in The Jerusalem Post was a tiny mention that an estimated one-third of the dead in yesterday’s IAF air strikes were civilians. Although I imagined there had to be great “collateral damage” during the assault, there were two things that struck me about the mention. First, it was in an article lauding the “year of intel” that went into the operation. Second, it was in The Jerusalem Post. Here was an article — in an Israeli newspaper — admitting there were great civilian losses during an operation that took a year to plan! I couldn’t believe the juxtaposition. I made mention of it to a couple of co-workers and then changed our link headline to stress that information. It was so odd that I thought it must have just snuck past an editor during yesterday’s chaotic reporting. So on a whim this morning I decide to see if an editor had gotten around to “fixing” it. Sure enough, now the civilian casualties are down to only “15” deaths in the article. Thankfully, The Mercury News saw fit to quote Palestinian Health Ministry official, Moaiya Hassanain, on that same estimate and hasn’t “fixed” their article. At least, not yet. This carnage is a living disgrace. Youtube had scenes of babies and young children being carried to emergency vehicles. Where is the UN now? Didn’t they call for a ceasefire? Or do the rules apply only to other countries? If the Israelis had not built the wall and kept the Palestinians from medical help, food, and jobs, Hamas would not have been sending rockets there in protest. What Israel is doing is inhumane and to say so is not to be pro-al Qaeda, no matter what the Prime Minister says. And shame on the so-called ministers of God who vocally support this murder because of their incredible ignorance of the Holy Scriptures. While we are all sinners and fall short of the glory of God, I would still love to be a fly on the wall when Hagee, Robertson and these other religious knuckleheads get called on the carpet at the Last Judgement. Condoning and encouraging murder is not the job of anyone, particularly for a representative of the Prince of Peace. Good luck in trying to justify that one! I know you are broken hearted, Corkey. Hagee and Robertson, and other anti-American interest preahers, were bought and paid for by wealthy Zionists and militarists. Very true. Broken hearted ? No. Just very sad for the dead and their families. Thank you, paulite, and to think that one of the first things Obama has promised to do, is turn over large dues to the UN. Excuse me, but you call purposefully, INTENTIONALLY, firing hundreds of rockets at civilian targets a “protest.” Don’t be silly. What the Rev. Martin Luther King did in Alabama and elsewhere, THAT was a protest. He did not set out to intentonally kill civilians. How can you call that a “protest” and keep a straight face? Preposterous! Is Israel perfect? Certainly not. Have they treated the Palestinians justly and fairly and humanely at all times? Certainly not. Am I happy that so many civilians have been killed by Israeli airstrikes? Certainly not! But the evil terrorists use that as an excuse to kill innocent people. This so called “cycle of violence” is almost always instigated by the radical Muslims of HAMAS. Israel pulled out of Gaza in 2005. 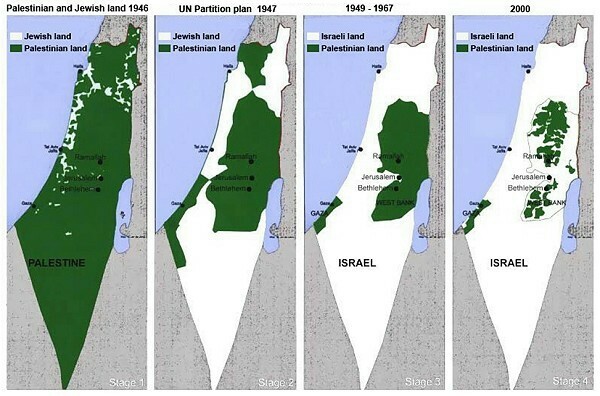 And what happend to the “land for peace” there is no peace? And do you know why? Do you know the real reason? Because HAMAS and the rest of the radical Muslim Nazis will not be satisfied until there are no Jews in Gaza, the West Bank, the Golan Heights, East Jerusalem, West Jerusalem, the Negev, or even Tel Aviv. They will not be happy until the whole nation is Judenrein…until all Jews are cleared out and the ones that are left pledge to be subservient to their Muslim overlords. For my money the Israeli press is often tougher on Israel than the Times. And I rejoice to see dovish Israeli think tanks sprouting up in DC. Have you all checked out J Street yet? There’s real hope out there, the kind that not even the Transition Team can crush. All bombing raids mostly kill civilians. Yeah, the promise of surgical strikes and pinpoint bombing are more or less just clever salesmanship. Yes, you can deliver say a 500lb bomb by laser or radar and get within 10 yards of where you aim, however, in built up areas that can mean the difference from hitting the desired building to hitting the hospital or orphanage next door, not to mention the number of lethal fragments that radiate out from the point of detonation that are far from guided objects or instruments of precision. Absolutely, and this by deliberate design. After all, U.S. Air Force General Curtis LeMay and RAF General Sir Arthur Harris, among others, both openly admitted during World War II that allied bombing campaigns against Axis cities were deliberately calculated to inflict maximum casualties upon civilians in an attempt to demoralize the population and prompt civil insurrection against the German and Japanese governments. The abject failure of this strategy, then and in all conflicts since, has altered battle doctrine not at all. Such bombing raids are merely an airborne extension of the 2nd Generation warfare against civilians that began in earnest with William T. Sherman’s march through Georgia during the War to Prevent Southern Independence and that has been part of modern warfare everywhere ever since. The Jerusalem Post is one of the most anti Arab papers in Israel. If they say 1/3 are civilians, the truth is more like 90%. There is no possibility that Hamas could completely ethnically cleanse Israel, even if you ‘believe’ they wanted to. They are no threat to the existence of the state of Israel. It is also pointless to play the blame game. It is far more productive to investigate strategies that benefit both the Israelis and the Palestinians. By pointing out the futility of existing hardline policies, we can only hope that these people wake up and see the light. Negotiating gradual engagement, diplomatically and economically, would go a long way to establishing foundations for further discussions (land distribution, etc.). Getting the dialogue working is the primary goal. When there’s hope of a solution, there is a goal to work for. Tim R. is a willing participant of that sicko PR campaign that justifies murder of one ethnicity or religion over another. Don’t waste your time arguing with him. And when is anyone going to mention all those Arab Christians that have mysteriously disappeared over the past 50 years. We know that the Muslims didn’t kill them all especially in Palestine and Iraq. And why is is it illegal to evangelize Christ’s name in Israel ? What are they afraid of? Or is that just God’s will too ? Why is Jesus Christ favorably mentioned in the Koran but called horrible names in the Talmud ? Look it up. Huh, huh, huh ???? Such mention most certainly will not be made by the “evangelical” brand of American pseudo-Christian that so loudly proclaims the devine power behind the current imperial Middle Eastern campaign. In these misguided creatures’ minds (such as they are), Ay-rabs are the sole exception to the belief that Christ was sent to redeem all of mankind. Ay-rabs, they believe, are Satan’s children, the “bad seed” of Abraham who are the implacable foes of the Jewish people, who are, in the evangelical mind, still the “Chosen People”, despite their categorical rejection of Jesus as the Son of God, the Messiah. No, they will never explicitly say such a thing (well, most won’t). However, the idea that there are Ay-rabs who are practicing Christians, who believe in Jesus as the Son of God and who worship him accordingly, tears to shreds their dispensationalist doctrine, a key pillar of their faith. For this reason, the existence of an Ay-rab Christian is, in their minds, as ridiculous and impossible to conceive of as the idea of a salt-eating snail or a vegetarian dog. It is much easier to pretend that such things just don’t exist. And whats even sadder is that Abraham fathered both Isaac and Ishmael who were half brothers. Isaac is the father of the Jewish people and Ishmael is the father of the Arabs. They are blood related with a common ancestor. Corkey, I don’t justify the murder of ANYONE, especially innocent civilians. And it saddens me to see innocent Palistinians get killed. ALL human life is sacred, be it Israeli OR Palestinian. And even when evil HAMAS terrorist get killed, I don’t celebrate. Any loss of human life to violence is no cause to celebrate. But what does HAMAS do when inncoent people are killed? They sing and dance in the streets( just like they AND their supporters did on 9/11/01). They WANT to kill innocent people and they rejoice when they do. They are not normal, reasonable people. They are psychotic, blood thristy lunatics who think that by killing innocent people they will go to paradise and get 72 virgins. Every single person who thinks they are “liberal” or “progressive” and stands up for them would get their head chopped off by these same people in two seconds. There will be no peace because the radical Muslims will not be satisfied until not only Gaza and the West bank, but everywhere from East Jerusalem, West Jerusalem, the Negev, Tel Aviv and EVERYWHERE in between is completely Judenrien, cleaned out of all Jews. They don’t want the 1967 borders. They don’t want the 1948 borders. They want Israel to CEASE TO EXIST. How do we know? Because they TELL US SO. On the other hand, Israel is certainly not perfect, far from it. They should try to do a lot more to improve the daily life of Palestinans. They should help them, give them money, food, medicine, build them roads and schools. I support all of that. But what I don’t support is making excuses for radical Muslim Nazis who wish to kill innocent people and destroy Israel. See, you keep saying this, but it’s Israel who has repeatedly rejected the one-state solution and continues to push Palestinians off of their lands and build illegal settlements. You can rant and rave all you want about radical Muslims wanting to “push Israel into the sea”, but the REALITY is the other way around. Why shouldn’t they want Israel to cease to exist? The founding of Israel in 1948 resulted in 750,000 refugees, no right of return, no compensation for lands forcibly stolen from them, a systematic cleansing of Palestinians from Jerusalem, building a wall that separates villages, families, neighbors and farmers from their lands, countless massacres and, as we see in Hebron today, 100,000 Palestinians forced to live by the whims of 500 settlers and deal with beatings, assault of children on their way to and from school, preventing Palestinians from working their own land…It’s ISRAEL that is making Palestine cease to exist! You can spew propaganda all you want, but I have NEVER met any individual who has visited the occupied territories and returned with the same opinion of Israel as any type of victim, democracy or anything but a racist blight on humanity. I have, indeed, been to the so-called “occupied territories” and my position is the same. You’ve been to the West Bank, Gaza, or the Golan Heights like I have been Mars. He probably meant the Outer Banks. Seriously though, if the roles were reversed, there is no way he supports this policy. The policy is unsustainable and even the stupid MSM is saying that there is no military solution to this problem. The real danger to be recognized is the developing push for confrontation with Iran. That is the likely next target of Israel. If ‘Bibi’ gets into office (Feb elections), its going to get interesting. If Israel (with the backing of the ‘Neocrazies’) attacks the Iranian nuclear power facilities, how will Russia react to its citizens (1600-2000 staff) and commercial agreements (oil, gas, nuclear energy) in Iran being attacked? The conflict in Gaza is going to be a picnic compared to the likely response to any attack against Iran, which may very well also see a Russian retaliation. Get ready for World War 3 gentlemen. This article is useful for me.I am appreciate it very much. Next Next post: Won’t Somebody Please Think of the Children?